In a food processor dump in all ingredients. Blend until creamy texture (this will feel like forever). Preheat oven to 450 degrees. Chop up cauliflower into the food processor (do not put stems in there, I repeat NO stems). Once you are done with that, the cauliflower should look like snow. Place the fluffy mixture into a microwaveable bowl and nuke for about 4 minutes. Take out of the microwave and dump into a lightweight clean towel. Wrap the fluff in the towel and wring it out over the sink. You will be suprised how much water comes outta that stuff. Dump fluff into a bowl and add all ingredients...salt, basil, oregano, garlic powder, red pepper, parmesan cheese and mozzerella and egg. Stir ingregients for a lil bit. Just like real dough you will need to kneed this fluff with your hands (get down and dirty with the fluff). Now form the dough onto a parchment paper. Pat the dough, try to use your best judgement by not making it way to think or way to thin. This is important. 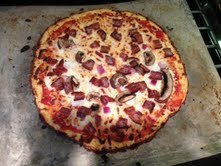 Now, get a pizza stone or a baking tray and carefully slide the dough onto that. You may want to spray the surface with some oil before hand if you have a regular baking tray. Cook for about 10-12 minutes. This is also where I say you NEED to be in close vacinity to the oven. Each oven cooks it differently. It's gonna either take longer or shorter to cook. Ok, so oncce cooked and has a slightly golden crust, take it out of the oven and start to add your pizza sauce, mozzerella and toppings. So, now you need to put it back in the oven again. Again, the time varies. So, cook around 5-7 minutes (you may need to also use your broiler). Tah dah! Done. and resemble cooked white rice. 2. Heat oil to cover the bottom of a small skillet on medium-high. 6. Lightly scramble the egg briefly then mix into the cauliflower. 7.Add the green onion tops and toss. Note: add some chicken if you want to make it a meal. salt and a touch of black pepper. Stir until spices are evenly distributed throughout the dish. add more stock to the blender and mix thoroughly. Return the puree back into a sauce pan where you can re-heat to serve. This can also be frozen and reheated with ease. It will smell like Christmas in your house when you are done!! You gotta read my blog on this. Hilarious. 1. If using fresh tomatoes drop them into boiling water for 1 min. Drain them an dpeel off the skin (when they are cooled off). Once they have been boiled the skin is easy to take off. Cut canned or fresh tomatoes into coarse pieces and reserve juice if you have any. 3. Add the olive oil and bring sauce to a slightly stronger simmer for 15 more min. Stir frequently and mash tomatoes with the back of a spoon. 5. Combine with cooked ground beef or whatever you like. Top with the parmesan cheese. Oh you are definatly gonna want to read my blog on this homemade spaghetti sauce...oy. Rinse potatoes well under cold running water, then drain and thoroughly pat dry. In a large nonstick skillet, heat oil over medium-high. Add onion and potatoes and season with salt and pepper. Cook, stirring frequently, until potatoes are almost cooked through and golden, about 15 minutes. Add zucchini, reduce heat to medium, and cook, stirring, until zucchini is soft and potatoes are cooked through, 7 minutes. Season with salt and pepper. **Cook this with either chicken, turkey, or hamburger meat. This is very versatile. Even alone this could be a main dish. It's great for those vegetarians! Heat the oven to 350°F. Shred the zucchini with a grater. Combine the flour, baking powder, baking soda, and spices in a large mixing bowl. In a separate bowl, whisk together the eggs, sugar, olive oil, and vanilla extract. Toss the zucchini in the flour mixture. Pour the liquids over top. Gently stir and fold just until no more flour is visible. Divide the batter between the two loaf pans. Bake 45-50 minutes. The finished loaves should have a golden-brown crust. Let them cool in the pan for 10 minutes. I have dreams of this bread. I dream that I get to eat it constantly and am never satisfied! Read my blog! Hash-Your kids will like this. It is easy. Cook hamburger meat on a skillet. Add the bag of Ore-ida potatoes, beef broth, pepper, and garlic powder. Cover with a lid on medium high for about 10 minutes, stirring in between. Basically, wait to serve until the potatoes look more golden and cooked through. **For added protein, you can always scramble some eggs in another pan and add that at the end. This stuff goes fast. It’s so tasty and easy to make. You can also substitute the bag of ore-ida for sweet potatoes and some freshly chopped veggies for a healthier route. All in all this recipe isn’t that bad for yah. Go to my blog to see facts about Hash and how awesome this is to prepare. 2. Grate frozen butter through the large holes of a box grater and toss with dry ingredients until butter is coated. Add milk mixture and mix lightly until dough forms a shaggy mass. 4. Pat into a circle an duse a floured rolling pin to roll dough to a thickness of about 3/4 inch. Using a 3-inch biscuit cutter, cookie cutter, or glass, cut the dough into rounds. Gather leftover dough into a circle, reroll, and cut until you have 8 or more large biscuits. 5. Place biscuits on a baking sheet, brush tops with some butter and bake unti lthe bottoms are golden brown, about 12-15 minutes. 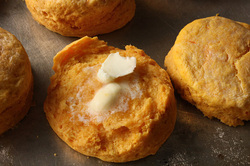 See my blog on Swee potato biscuits...um...can we say...what an experience! 1. Preheat the oven to the 350 degrees. Season the eggplant slives with salt, and let stand for about 10 minutes. Drain off liquid. 2. Heat 3 tablespoons of olive oil in a large skillet over medium-high heat. Quickly brown the eggplant slices on each side. 3. Place a layer of the eggplant slices in an 8 inch square baking dish or casserole dish. Plave some tomato slives over the eggplant, and then a few slives of onion. Sprinkle parmesan over each layer (add meat at this time if you wish). Repeat layers until you run out of eggplant. Pour balsamic vinegar over everything. In a small bowl, stir together the bread crumbs and remaining olive oil. Season with salt and pepper. Spread in a layer over the vegetables. 4. Bake for 25 to 30 minutes in the preheated oven, until the top is golden brown and the eggplant is tender. Go see my blog on this stuff. It's the bee knees. It's the cat's meow. It's the...the...just go.